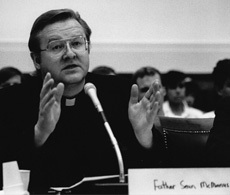 Sean Mc Manus testifying at a Congressional Hearing in 1995. WHEN you strip everything away and consider the sorry mess we’re in, what is this election ultimately about? Surely it must be about whether we can elect representatives who will treat each other with sufficient respect and common decency to build the necessary trust to make Northern Ireland work. For that to happen there must be a will on the majority unionist side to embrace and cherish power-sharing rather than barely tolerate it as a necessary evil. On the nationalist side, there must be genuine respect for the doctrine of consent and no desire to pursue a premature referendum on Irish unity. A protracted period of direct rule can only be avoided with the building of trust, and that will only come if politicians are prepared to treat one another with genuine respect, basic civility and display a desire for reconciliation. The Ulster Unionist Party under Mike Nesbitt is clearly up for wholehearted power-sharing, but the UUP don’t appear likely to overhaul the DUP, although after the shocks of Brexit and Trump nothing can be taken for granted. The election has come long before the SDLP, with more youthful talent than of late, and the UUP have had sufficient time to prove themselves in Opposition. The poll which nobody wanted was forced by Martin McGuinness when he appeared to be left with little alternative by the arrogance of Arlene Foster. She had forgotten that fact of life to her cost and that forgetfulness and her mishandling of the “cash for ash” scandal and its attendant drip drip of information may yet cost her the leadership of her party. And possibly also cost the DUP its treasured ability to trigger the petition of concern on its own, and conceivably, in this age of surprises their status as largest assembly party. That said, it would be an unwise to write off Arlene. She may have disappointed many recently, but she is a politician of considerable ability, and her supporters will hope that she can recover quickly. It is a sobering thought that nearly twenty years after the Good Friday Agreement and nearly ten years after the Rev Ian Paisley and Martin McGuinness came together as improbable joint heads of Stormont that the jury is out on the question whether Northern Ireland can really work. It becomes alarming when you consider that all this is happening at a time when the island of Ireland’s future within the European Union will be high on the agenda in the Brexit negotiations amid real fears of the re-imposition of barriers within Ireland against the will of our people and the exit of Northern Ireland from the EU against its will. The DUP seem to be the main culprits when it comes to displaying disrespect although Gerry Adams’s Enniskillen speech rightly rankles. The DUP ignominiously dumped the Rev Ian Paisley as First Minister because he had the grace and statesmanship to forge not just an excellent working relationship but a genuine friendship with Martin McGuinness that became the wonder of the world. Ten years on, some DUP politicians haven’t the basic decency to bid Sinn Féin colleagues the time of day let alone sit down with them for a cup of tea. Their dreadful manners demean themselves and insult those who elected those Sinn Féin politicians. Paul Givan, DUP minister for communities who under the ministerial code of conduct is bound to “operate in a way conducive to promoting good community relations and equality of treatment” recently on “live” BBC TV admitted that the DUP “don’t seek to be friends with Sinn Féin” and only did business with them because they had to. Even Foster couldn’t bring herself to publicly wish a frail McGuinness a speedy return to good health when she recorded what was intended as a first ministerial-looking address on Facebook on the day McGuinness announced his intention to resign. Her subsequent good wishes when he quit politics altogether, however genuine, looked belated. So, thank God for Ian Paisley Junior, the DUP MP whose warm, courageous and justified tribute to Martin McGuinness on BBC’s The View and elsewhere points the way to the respect and decency that must take hold after the election. 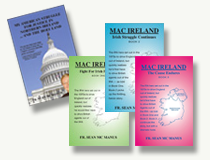 Order your copies of "My American struggle for Justice in Northern Ireland... and the Holy Land —" as well as "Mac Ireland series: Books One, 2 and 3."